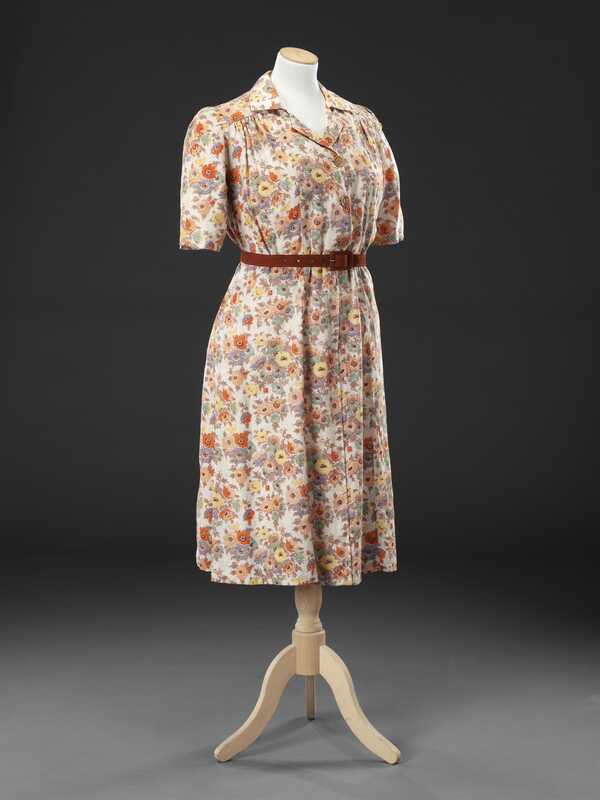 This dress, unremarkable in style for the late 1930s, is made from a printed linen manufactured by Liberty & Co, a company well-known for its floral fabrics. It employed no designers of its own at this time, relying instead upon those of independent studios such as the Silver Studio which had supplied them from the late 19th century onwards. 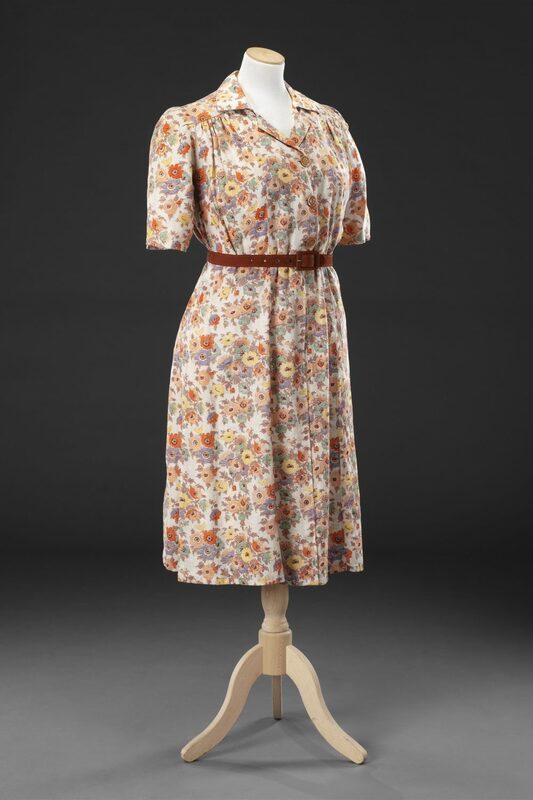 During the 1920s and 1930s Liberty bought many of its successful floral designs from the Silver Studio, including this one of 1927 by Madeleine Lawrence. 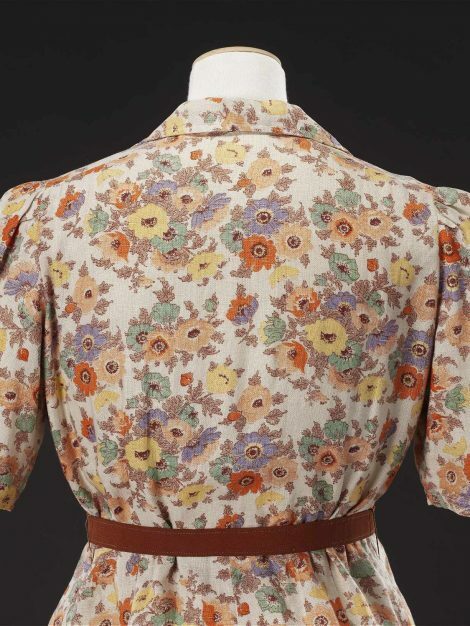 It was available in a number of colourways on pale and dark grounds, on silk, linen and cotton, and was still part of the ‘Country Cotton’ range over fifty years later. 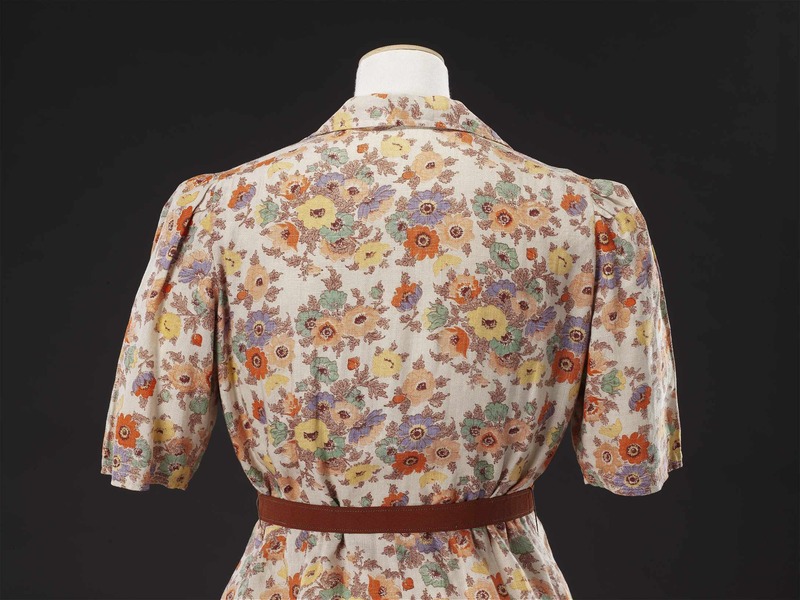 The Silver Studio employed both male and female designers, the women being considered particularly competent at floral and nursery prints. Unlike the men who worked at the studio, women worked from home, in Madeleine Lawrence’s case at Leigh on the Sea, Essex. This necessitated written instructions and appraisals to be sent by post, some of which survive providing an insight into the design process and working conditions. Copies of letters from Rex Silver to Lawrence demonstrate how detailed and demanding these instructions could be, and a time sheet of June 1935 shows that she was paid £1-8-10 for a 42 ¼ hour, six-day week, less than the cost of a yard of some Liberty fabrics at that date.